You should make pasta because at some point, we’re all going to die. One way or another, late or early, peacefully or unexpectedly we all end up at the same end. And in the endless stumble forward it’s easy to gloss over the details. To treat the important things like speed bumps. To lose the trees for the forest and loosen your grip on the moments that are swirling past. And those moments have a way of becoming all too fleeting. At some point you need to take your eye off oblivion and fix it squarely on what’s around you. That is where pasta comes in handy. The fresh stuff, at least. 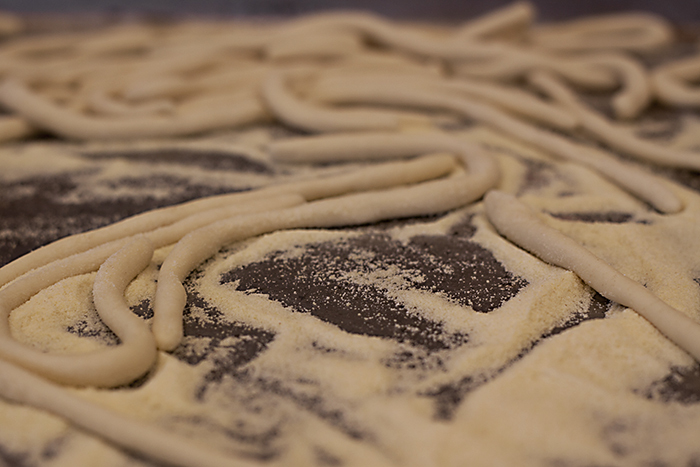 In order to make fresh pasta you have to make the conscious decision to spend an hour or two on something that is readily available in a box. And there’s nothing wrong with the boxed stuff, it’s delicious and cost effective. But it doesn’t get your eye back on the ball like meditatively working flour and water into a dough and then working that dough into the same tiny repeatable shape over and over again. Little else does. Make a point to get up early, before the day has had a chance to creep in. Hide your phone. Leave the TV off– if you want to listen to something, open your windows. 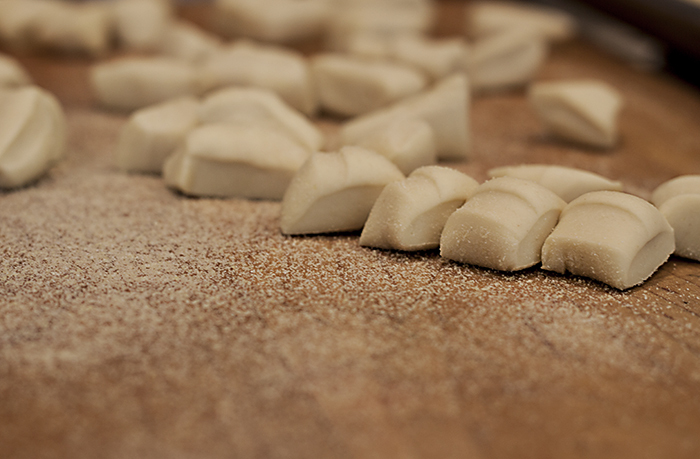 Work your hands into a mound of semolina and double zero, feel the textural contrasts within your palm. Add water and friction until you have dough where there was once only grain. Work the dough with purpose. As you do, time will slow with the rhythmic and the tactile. And if you tilt your head and pay attention, you will be able to feel time flying softly over and around you and you will be immersed in the present. You will begin to understand cosmic realities that are typically reserved for greater men than you. Knowledge will be given. And just as quickly it will slip through your fingers like so many grains of durum. And it will be time to chase the day, setting into motion all of the things that fill and distract us. But there will be time again to regain clarity. To feed and nurture those around you with what you have created. There are important people surrounding us and they deserve time and attention. They deserve the present and the unspoken togetherness of truth. Look them in the eye. Embrace them. Feed them. Just don’t tell them that you pondered their unavoidable demise while making their noodles, it makes for an awkward dinner. Mix the flour together, add the water a little at a time and work the mass on a well floured board. Once you have a dough, work it for a good 10-15 minutes. Let it rest for an hour and then roll small pieces into thickish ropes about 6 inches long. Serve with a hearty ragu.